I thought it is the best solution. 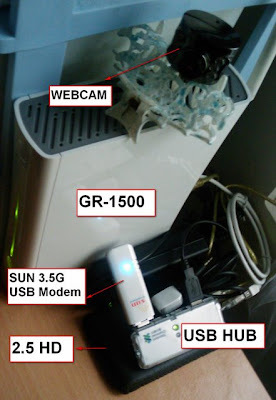 Since we started to use the SUN 3.5G plan, we had one big problem that our 2 cellphone and 2 laptop need to online at the same time and SUN only provided one 3.5G USB Modem. What could we do for the problem? Before we came back to Taiwan, our solution is that one laptop with 3.5G modem is on line and share the Internet by build-in function of Windows OS. The laptop connected with Access Point (AP) by twist cable/cross cable, and the Access Point broadcasted the 802.11g signal to the other machines. 1. The laptop must always be turn on. 2. The downstream speed is not stable: Because of the limit of Windows OS, the share speed is slowly and unstable. After we were back to Taiwan, I did some research for 3.5G Access Point. There were some candidates in online auction and shopping websites. We got 3.5G modem, huawei E160 from SUN. ZyXEL ZyWALL5-N have the best specification of all. It supports 802.11n、Gigabit Ethernet, but it supports Huawei E168/E220/E800 3.5G modem. EVERelite MOR600 doesn't support Huawei E160 and have high price, so we canceal the candidate. SAPIDO GR-1100 and GR-1500 have one different point. There is 4 LAN ports in GR-1500. The products of SAPIDO have good extention functions, like Printer, Webcam, HDD, Flash, and Card-Reader, Built-in FTP and Samba Server. They also support 3.5G modems of many brands. Finially, I chose SAPIDO GR-1500 and use it happly. any chance you can help me get a sapido gr-1100? Because of Shipping fee and brand new one, it is more than 4000 Piso.